Nat Geo Assignment: Shall We Eat? Paan chewing man, India has been submitted to ‘Shall We Eat?’ on National Geographic. Kristian Bertel has contributed to the Nat Geo Your Shot community with an assignment called ‘Shall We Eat?‘. Curated by Kristen McNicholas, an associate photo editor at Nat Geo Your Shot, we should show our food in our lives and what is special about the dish or cuisine. Does it remind us of a home that might be far away or did our relatives teach us the recipe. As Kristen is saying it: ”- Food is the best. It’s one of my favorite things. Whether I’m eating pizza in bed with my best friend while we watch our favorite TV show, enjoying my dad’s favorite restaurant at home in New York, scoring free snacks at work, or treating myself to sushi, food connects us. It sustains us physically, and sometimes, emotionally. Your photo just has to relate to food, and then use your caption to tell me more about it. I want my mouth to be watering as I read the stories that bring a photo of food to life. Teach me something about the character in your photo, whether that character is food, a person, or even a place”, she says. It is a tradition in South India and nearby regions to give two Betel leaves, areca nut in pieces or whole and Coconut to the guests both male and female at any auspicious occasion. Even on a regular day it is the tradition to give a married woman, who visits the house, two Betel leaves, areca nut and coconut or some fruits along with a string of threaded flowers and this is referred to as ‘Tambolam’. The photographer has been interested in portrait photography for a long time. Especially also when the photographs also are showing daily life in India. 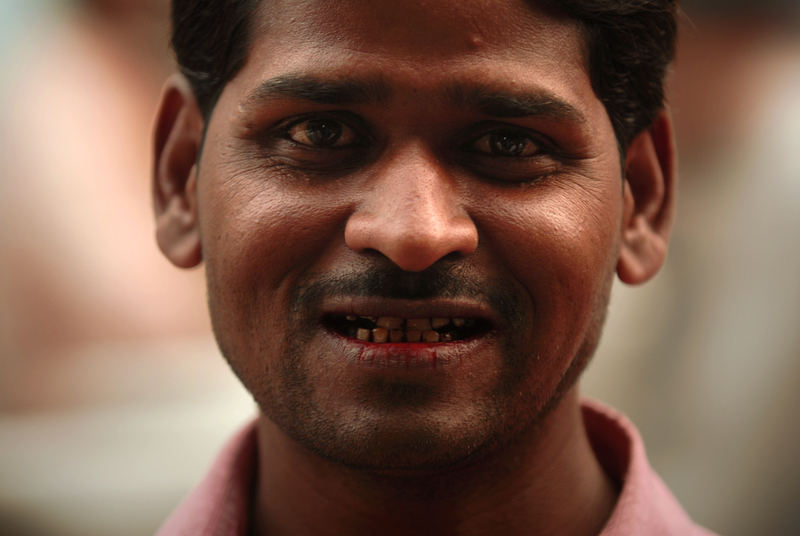 In the submitted portrait taken by Kristian Bertel | Photography we see an Indian man chewing ‘Paan’. Paan made with areca nut and lime, with or without tobacco, causes profuse red colored salivation. This saliva is spat, yielding stains and biological waste pollution in public spaces. Many countries and municipalities have laws to prevent Paan spit. In the Indian state of Maharashtra the Paan culture is widely criticized due to the cleanliness problems created by people who spit in public places. In Mumbai, there have been attempts to put pictures of Hindu gods in places where people commonly tend to spit, in the hope that this would discourage spitting, but success has been limited. ”- Paan chewing constitutes an important and popular cultural activity in India”, the photographer Kristian Bertel says.